Five minutes before I have to leave for college, I ransack the overstuffed counter in front of the mirror, desperately searching for an eye pencil (on the days I actually feel like making an effort). I give up after three minutes of scavenging, upturning numerous things in the process. I leave without cleaning up the mess. This happens quite often, and I’m left with more difficulty in finding what I need. I keep a lot of things along with makeup, which adds to the problem. Most of us don’t have a separate place for makeup. It lies along with our accessories, clothing, etc. And you don’t need to have a separate area for makeup at all. If well organised, makeup will be easier to use, and hence make you feel less guilty about owning makeup in the first place. This is the most convenient way to organise makeup when you have only a small section of a counter or a table for storing your makeup. The sections help to divide your makeup based on type. Here, you can see that each divider houses a particular kind of makeup– lipstick, liners, etc. Plus, you can see all your shiny packaged makeup, and actually know how much you have, so that you can use them well. Pick up a clear organiser on Amazon India, or try searching in any home/plastics store. Have plates that are too pretty to not be shown off? Use them to organise your makeup! The compartments that come with stacking dinnerware on top of each other are versatile enough to store different kinds of makeup– like seen in the picture above. It makes for a great piece in your room and you can even keep your phone/accessories on it. Head here for the DIY (which is unfortunately not simple). Or go the easy way out and use a tiered tray– the ones used to display cupcakes & food would work brilliantly. I can’t find any tiered trays on online Indian stores that are in stock. This one seems to be the best option though. You get them at any home/plastics store as sets (try Home Centre, Homestop, or Sundar Metals in T. Nagar). 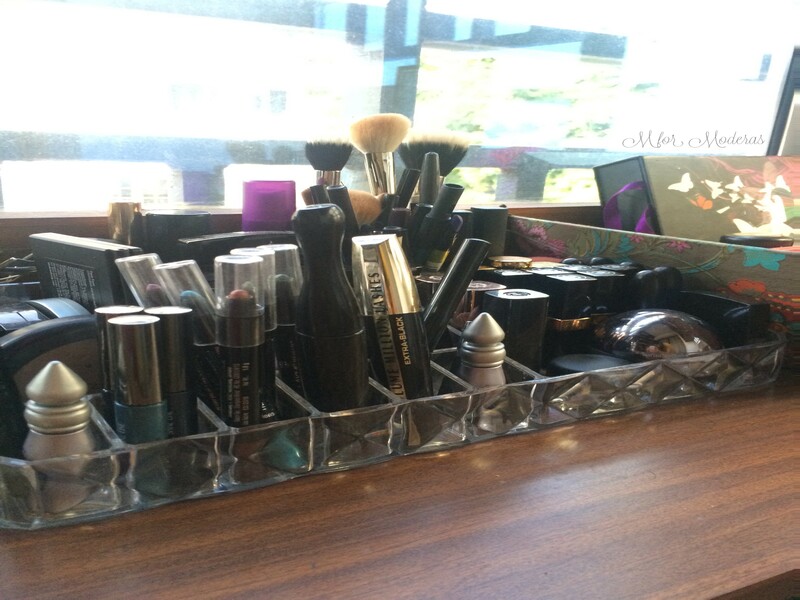 This is a great idea to keep your makeup uncluttered while in a drawer. This method gives you control over what goes where, and you can organise your items by type, frequency of usage, etc. Plus, they make your drawers look really pretty, and it is an inexpensive, fuss free way to do things. Depending on the depth of your drawers, you can also stack dividers, and pull them out as required. You can even DIY dividers by using tops and bottoms of any light cardboard boxes (such as cereal boxes, boxes that come with cellphones, etc). This is a genius way to organise makeup, especially if you have a LOT of makeup to store. You can organise them in numerous ways without it taking up any space. You just have to make sure you don’t slam the back of the door into the wall. There are so many pockets, you might be tempted to buy more makeup to fill them all up! (Don’t say I didn’t warn you). Pick one up from any online/brick-and-mortar organising store, there are lots of options across price ranges. Got an unloved book shelf? Make the best use of it by using sets of round containers (pen stands, etc). I suggest this method for shelves because it’s easier to access all your makeup this way; you can’t look over the tops of most shelves so this helps in a rush. All you have to do is tape the tops together, and you’re done. You can use as many or as little divisions as you want. LifeAnnStyle uses old candles, which is a genius way to do this. Head over here for the DIY. You can even use cute paper cups, for lighter items. Alternatively, if you have a lot of pretty plastic bottles, you can cut off the necks of the bottles and use them for this too. This is a pretty innovative way to use your old baking pan. It has a nice touch to it. It might require a larger countertop though, and isn’t the neatest option, but it will work in a pinch. Plus, it adds versatility with respect to what you can store. How do you store your makeup? Have a suggestion? Comment below, and I will feature it here! The stacked tea cups are so FLIPPIN cute for decoration! What a great idea! I know right? It’s adorable!